Dominion Energy GardenFest of Lights is a holiday tradition featuring more than one million lights, botanical decorations, trains, holiday activities & more. To learn more details about Lewis Ginter lights, this year’s theme and tips for your visit, see our main Dominion Energy GardenFest of Lights page. The event runs Friday, November 22, 2019 – January 6, 2020 (Closed Thanksgiving, Dec. 24 & 25). 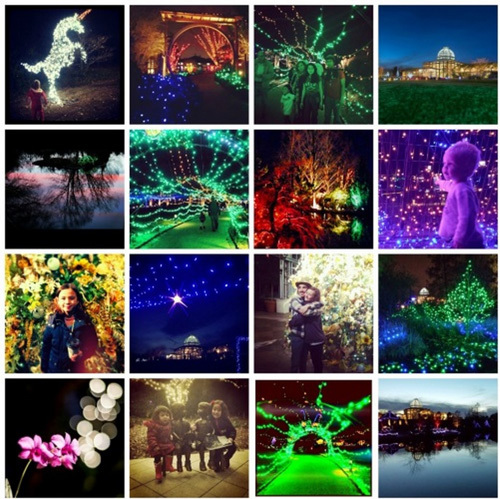 This year, famous works of art will come alive during Dominion Energy GardenFest of Lights. The exhibition will re-interpret well-known works of art in a spectrum of sparkling color, inviting guests to discover how sculpture, dance, music and paintings are informed by the natural world. Visitors will wander through a festive landscape alight in glimmering radiance and delight in handcrafted botanical decorations, all designed to illuminate nature and her power to inspire. Scroll down for more info on this event including bulk ticket sales, discounts and group rates. A holiday tradition featuring one million twinkling lights, hand-crafted botanical decorations, model trains, holiday dinners, family activities and more. Visit often to fully experience GardenFest — the region’s ultimate holiday extravaganza! Go for the glow of more than a million lights and make warm memories of time spent with family and friends. Great shopping, dining, tours & more! GardenFest of Lights is a “rain or shine” event and is only closed for extreme inclement weather. Dominion Energy GardenFest of Lights Illumination — November 22, 4-10 p.m.
GardenFest for Fidos — Thursday, December 5, 2019, and Thursday, Jan. 2, 2020. Location: Library Reading Room; Santa “sightings” in the Conservatory on Mondays through Dec. 17. Storytime fireside with the Garden Keeper. Caroling Tuesdays “Four in the Morning” strolls the Garden with musical medleys. On Artful Wednesdays families can participate in interactive art-making, creating projects based on displays from this year’s theme. 5-8 p.m. in the Kelly Education Center, Classroom 1 (across from the train room). Acoustic musicians perform festive entertainment. Learn more. Come toast s’mores (for purchase) and warm up at the Kelleher HVAC Warming Fire. Publishes on Thursdays in the Weekend Section; coupon must be presented at the Garden’s Visitors Center for the discount, no photocopies accepted, no other discounts apply, one free admission per coupon. Visit our Discounts page for more information. Valpak is mailed to Richmond-area residences; offer valid with coupon only. One coupon per person. May not be combined with other discounts including member discount. No photocopies accepted. Visit our Discounts page for more information.